The Most Honorable Portia Lucretia Simpson Miller O.N., B.A. will keynote the Union Institute & University National Commencement on Saturday, October 28, 2017 in Cincinnati, Ohio. The former Jamaica Prime Minister is a 1997 graduate of Union Institute & University. Ms. Simpson Miller served as Jamaica’s prime minister from March 2006 to September 2007, and again from January 2012 to March 2016. She retired in 2017, after serving as the leader of Jamaica’s opposition party (People’s National Party). She, like so many Union alumni and students pursued her education against all odds. Ms. Simpson Miller says that she chose to study at Union Institute & University to broaden her knowledge base and solidify her academic credentials, which became necessary to advance in a political career that began while she was still in high school. Despite her demanding schedule and extensive responsibilities throughout the years since her graduation, she has maintained her friendship with the faculty and staff at Union. Angela Byles, Florida Academic Center Associate Executive Director, remembers meeting Simpson Miller in 1994 when she enrolled at Union’s Florida Academic Center. “It was an honor to meet Ms. Simpson Miller for the first time in 1994 when she visited the Florida Center to meet with the Dean. I was struck by how humble she was and easy to talk to. At that time, her portfolio was Minister of Labour and Welfare in Jamaica.” said Byles. 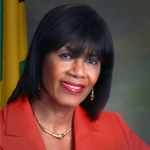 Ms. Simpson Miller’s ascension to Jamaica’s highest political office came after having served for 17 years as a Cabinet Minister with portfolio responsibility for Labor, Social Security and Sport; Tourism, Entertainment and Sport; and Local Government, Community Development and Sport; in addition to Women’s Affairs. In March 2007, she was awarded the International Olympic Committee’s World Women and Sport Trophy for outstanding dedication to women in Jamaican Sports – both athletes and administrators. In 2009, she received the Distinguished Award for her dedication and commitment to urban renewal and community development from the Mayor of the City of Miami. She received the Bureau of Women’s Affairs Award for outstanding contribution to the advancement of women’s affairs in Jamaica. Mrs. Simpson Miller holds a Bachelor of Arts in Public Administration from Union Institute & University. She also completed the Executive Program for Leaders in Development at Harvard University’s John F. Kennedy School of Government. In 2001, Prime Minister Simpson Miller was awarded Union Institute & University’s highest honor, the Honorary Doctorate of Humane Letters: Honoris Causa, in recognition of her achievements and commitment to transform lives and communities. She holds an Honorary Doctorate of Public Service from the Northern Caribbean University, and an Honorary Degree of Doctor of Laws (LLD) from the University of the West Indies, Jamaica.